Based on Judith Gwyn Brown’s 1963 children’s book, Max tells the unconventional love story of a boy, Max (Kevin Michael Murphy) and his new pig, Suzette (Jennifer Albano), who discover their purposes in life while on a fungus-digging adventure for Max’s blustery chef father Gerard (Jeremy Schwartz). Suzette isn’t really a truffle pig; in fact, she can’t stand dirt at all. But the local Comtesse (Antoinette LaVecchia) has a hankering for truffle cake, and her approval could make Gerard’s name. 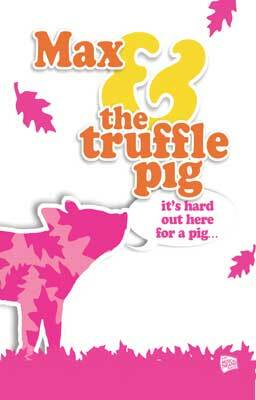 "Scarcely a minute passes without some solid-gold sight gag or astounding, throat-stretching song..."
"30 Days of NYMF 2008: Max & the Truffle Pig"